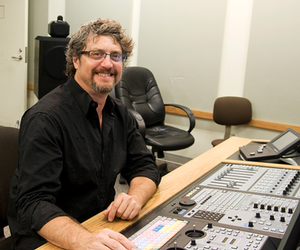 Konrad Strauss is a Professor of Music and director of Recording Arts at Indiana University’s Jacobs School of Music. Prior to joining the faculty of IU he worked as an independent producer/engineer based in Chicago; and had served as as chief engineer for Classic Digital Inc, and a staff engineer at the Chicago Recording Company. He has recorded and produced records for numerous artists such as the Chicago Symphony Orchestra, New York Philharmonic and Seattle Symphony, Itzhak Perlman, and Daniel Barenboim; record labels such as Teldec, Atlantic, Geffen, RCA Red Seal, Koch Classics, New World Records; and many others. Studio work has included projects for the Cirque du Soleil, Mannheim Steamroller, and Dave Brubeck; television commercials for United Airlines, McDonalds, and Allstate; and television projects for ABC, and CBS, and HBO. As a mastering engineer, Mr. Strauss specialized in independent rock for labels such as Drag City, Touch and Go, and Thrill Jockey. His recordings have won numerous awards including Grammys for best chamber music record and Best Gospel record, a Hugo award for best children's programming, and accolades from publications such as Fanfare, Gramophone, American Record Guide, and Stereophile.